New Material on the Sola-Busca Tarot: The SB and Two Alchemical Mss. 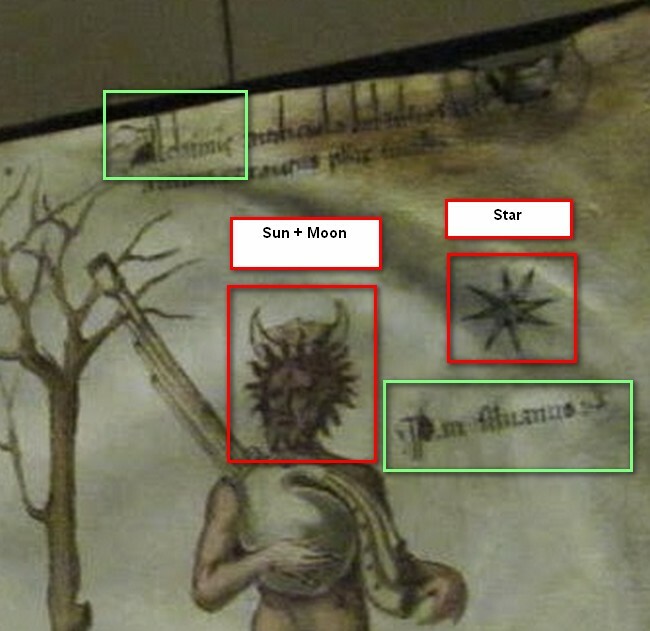 The SB and Two Alchemical Mss. 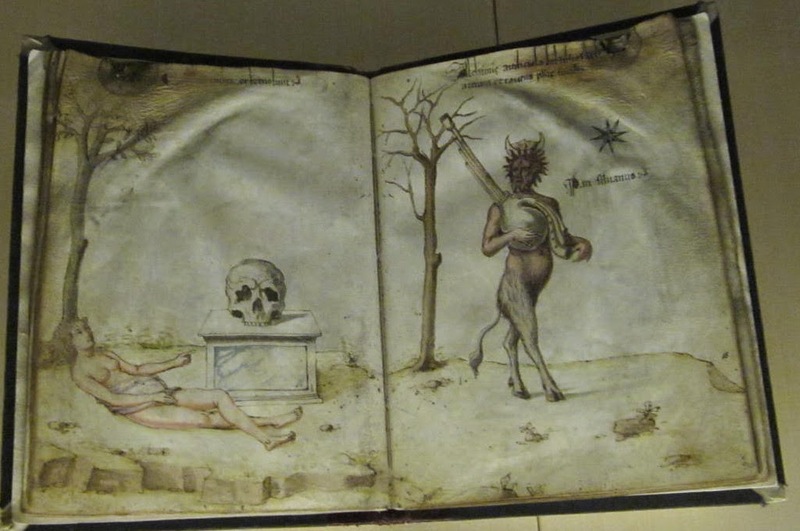 Gnaccolini's essay describes two alchemical treatises that were part of the exhibition. In this post I am going to ddiscuss how she relates them to the cards. Be advised that in this post I will not talk about Lazzarelli at all. His writings, in so far as they have been translated, I have not been able to relate to the deck, except very generally to the last two trumps, as I explained in my previous post. In Swords, she says that the swords on the 3 are gold, silver, and mercury, or (in footnote 81), sulfur, mercury, and salt. I see nothing to suggest such a thing except the number 3 (http://www.tarotpedia.com/wiki/Image:S03_Sola_Busca.jpg). 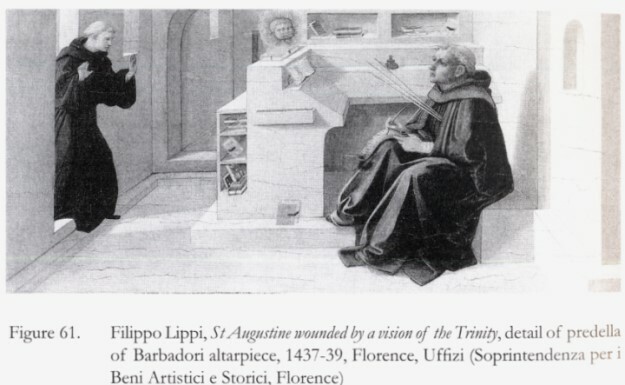 I would have thought it was the Trinity, comparing it to paintings of Augustine's vision of the trinity, especially the one by Fra Lippo Lippi, Florence 1437 (http://3.bp.blogspot.com/-88GjAe5xY3o/T ... tioned.jpg, in color http://www.fineart-china.com/htmlimg/image-32096.ht). The heart, she says, is an alchemical symbol for fire, which presumably melts them down. While the heart is a common religious image, I myself have not seen a heart pictured in alchemy until Jacob Boehme, 1689, where indeed it is associated with fire, probably meaning "burning desire". She cites a 1612 Frankfurt alchemical dictionary,by M. Rulando. She also thinks that the heart has the connotation of a "vital process" and so makes of the alchemical process something alive. VI SESTO (http://queenoftarot.com/tarot_cards/1211) is Mercury, she says. Presumably that is because there are wings on his shoes. If so, she should identify VENTURIO with Mercury, too; he has wings in the same place. XVI OLIVO (http://queenoftarot.com/tarot_cards/1221) has the sun, alchemical gold. She also relates the basilisk at his feet to gold, saying that it represented a substance which in powder form could bring out the gold, a doctrine she finds in the 12th century writer Theolopholus. The basilisk has a negative side as well, which she does not mention. It could kill with its fiery breath, like a dragon. III. LENPIO (http://queenoftarot.com/tarot_cards/1208) might be the lighting or stoking of the fire, preparatory to the work. IV MARIO (http://queenoftarot.com/tarot_cards/1209). 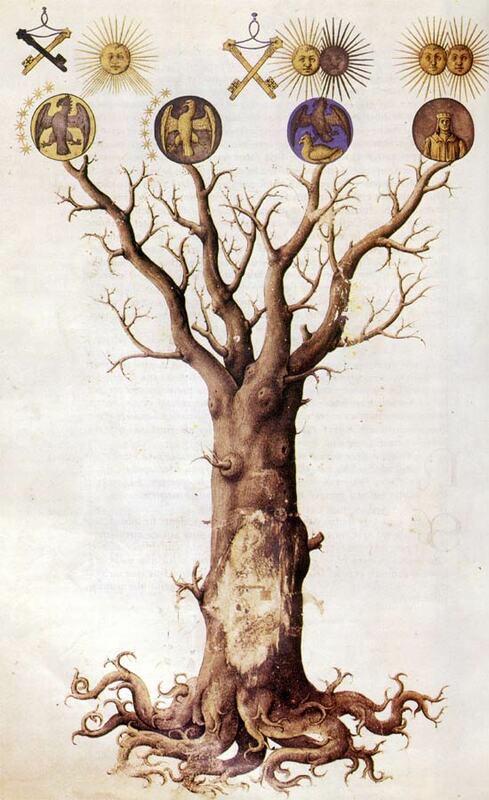 The tree with leaves symbolizes growth and life.But the wings on his helmet and the red clothing suggest Mars. I do not know what that would mean alchemically, except some kind of strengthening. XI TULIO (http://queenoftarot.com/tarot_cards/1216), again shows fire. XIII CATONE (http://queenoftarot.com/tarot_cards/1218). 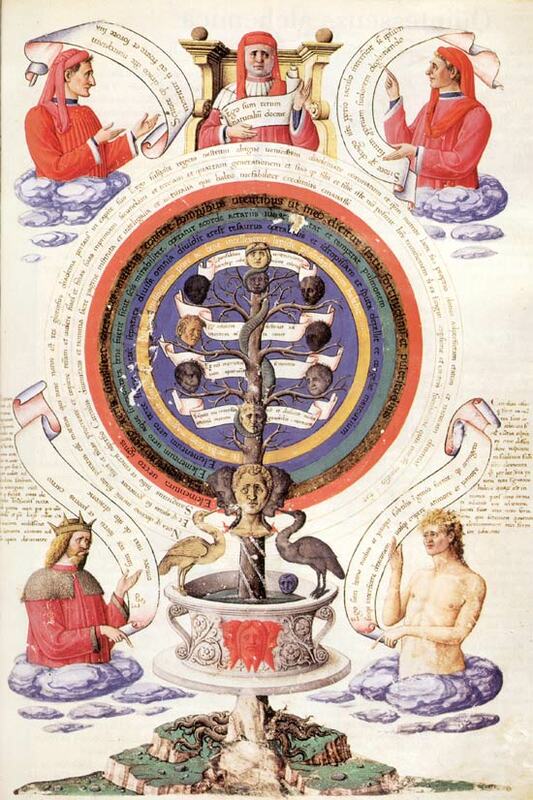 The severed head is an alchemical symbol in the Splendor Solis, where the one severing it holds it up as a trophy. I suspect that it has to do with thought, cogitation. But Catone is not holding the head but pinning it to the ground. XVII. IPEO (http://queenoftarot.com/tarot_cards/1222). Tarotpedia (http://www.tarotpedia.com/wiki/Sola_Busca_Cards:_Ipeo) notes that the wings are similar to those on the hermaphrodite of the Rosarium Philosophorum.http://www.levity.com/alchemy/rosary5.html. Gnaccolini has one amusing tidbit (footnote 98) that I cannot resist passing on: the man on the 2 of Batons might have been a caricature of Cosimo de' Medici the Elder, she suggests (http://queenoftarot.com/tarot_cards/1164). Compare to his portraits: http://en.wikipedia.org/wiki/Cosimo_de%27_Medici. It is believable. I have discussed the image on the left already at length. The image on the right is new to me. On the one hand, the stylized horns and round middle suggest the sign for Mercury. the figure resembles the astrological sign for the planet. Horns and hooves suggest the Devil--Mercury's destructive side, in other words--as well as the god Pan, for undifferentiated nature, as "Phaeded" suggested in a comment on THF (http://forum.tarothistory.com/viewtopic.php?f=11&t=988#p15906). Pan also had a bagpipes, as he shows by a link to the Hypnerotomania of 1499 Venice. So the flask of transformation is configured like a bagpipes. 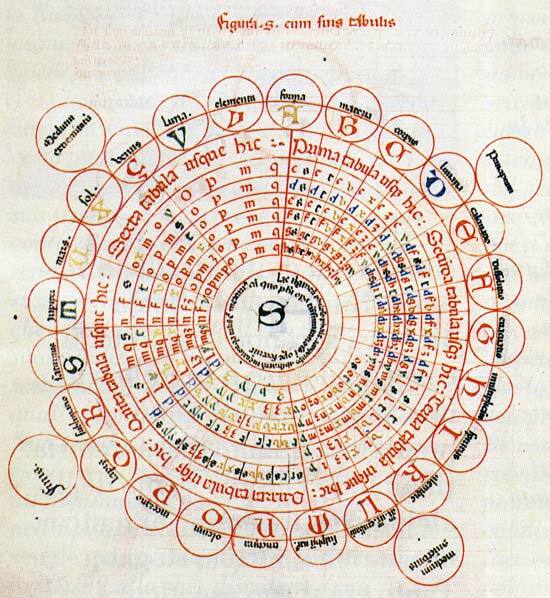 In the Sola-Busca, the massa confusa corresponds to the Mato, card 0. He, too, holds a bagpipes, i.e. the flask by which he will be purified and raised up--or if nothing else, contained, as is shown in the last card (http://queenoftarot.com/tarot_cards/1226). 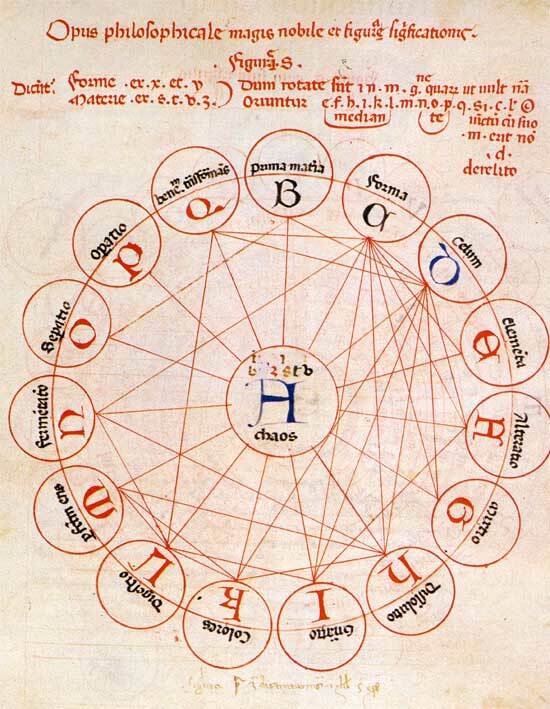 The circle containing the starry sky is also the hermetically sealed container of the terrible dragon of chaos. I did not know Pan as an image employed by the alchemists early on. Yet it is right there on the page, as "Huck" points out, the word "Pan". .The image also combines three other basic symbols, he points out: Star, Moon, and Sun. I would add that Moon and Sun are also female and male; their combination is the hermaphrodite Mercury, the Devil of the tarot. and his posts immediately following. In addition, Phaeded amplifies the SB Mato card's imagery by comparing it with imagery associated with Marsyas, the satyr who challenged Apollo to a music contest. at http://forum.tarothistory.com/viewtopic.php?f=11&t=988&start=10#p15964 and his post following. Of interest also is the artist to whom these illuminations are given, a Venetian. But if the artist is Venetian, what is it doing in the Laurenziana? 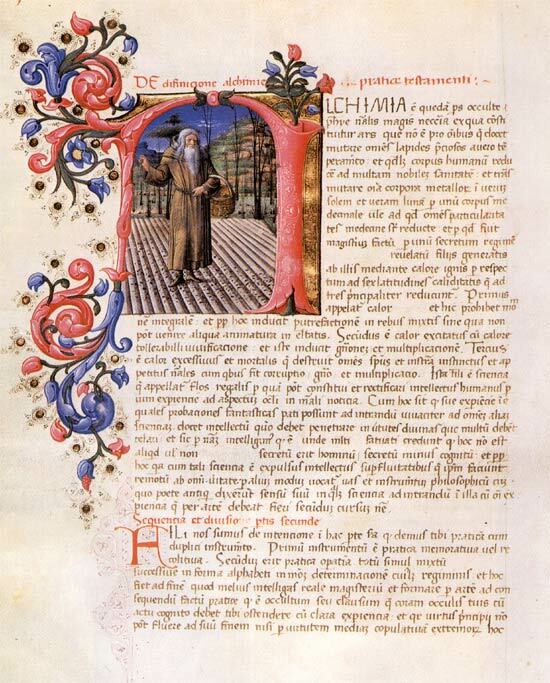 It is possible that the manuscript was produced in Florence, with the artist coming there at the time. Also, the text might have been done in Florence and the illuminations in Venice: it was a common practice to do the two parts in different places. Most likely, however, both parts were done in Venice, and the book acquired later. Since one of the 16th century Medici "grand dukes" was a practicing alchemist (see http://en.wikipedia.org/wiki/Francesco_ ... of_Tuscany), that is the likeliest alternative. That of course puts it very much in the ambit of the Sola-Busca and Leber decks, as well as of the interests shown in Lazzarelli's later works. Lazzarelli as designer of the SB?